Some of my favorite yarns to work with come from Bijou Basin Ranch. Their yarns are lightweight, high quality, and come in a wide range of amazing colors. Bijou is always working to offer new colorways dyed by independent dyers, and you can see the passion in the yarn makers’ and dyers’ work. I’ve designed two shawls and a hat using Bijou’s gorgeous yarns featuring yak fiber so far. If you’re looking to try one of Bijou Basin Ranch’s yarns, each of these patterns calls for a different one, so they’re a great place to start if you’re curious! Most recently, I designed this one skein shawl pattern using one of Bijou’s special colorways and their Shangri-la yarn, a delicate silk and yak blend. 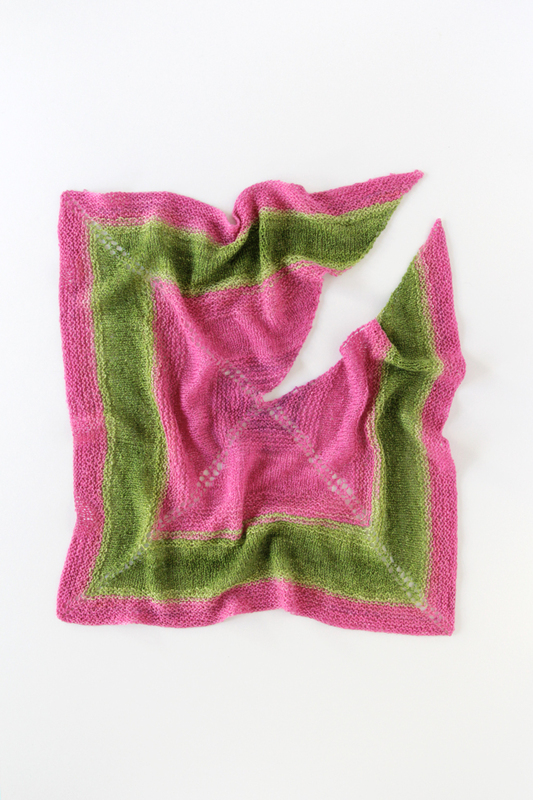 The finished Top Notched Shawl feels so elegant, like something a lady would wear in a period drama – but, you know, pink and green. 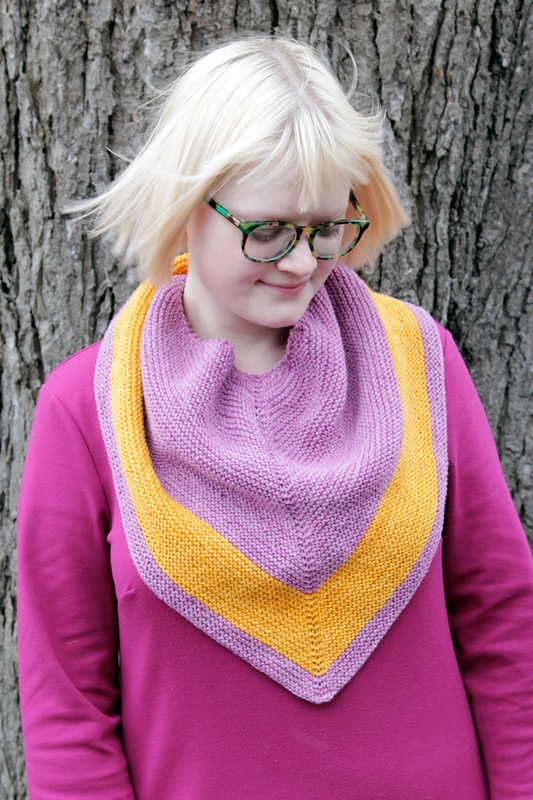 If you like this project, Bijou has some new colorways that are custom dyed by Lost City knits, and they’re gorgeous. 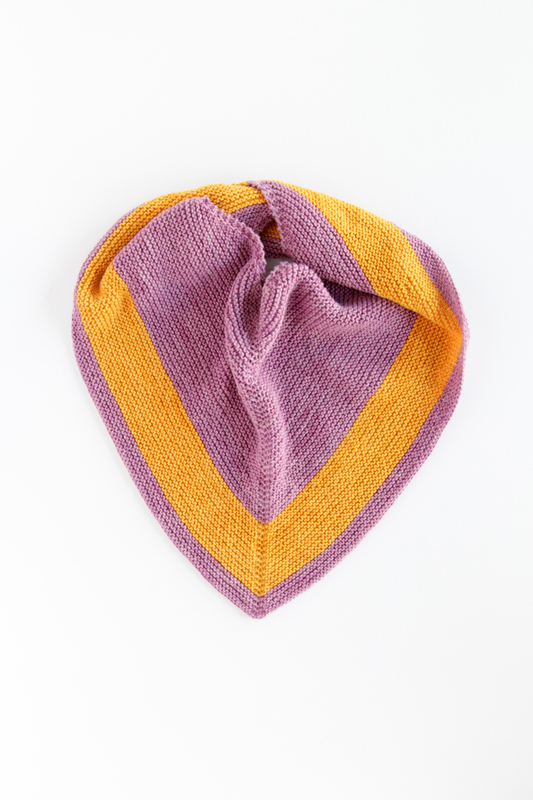 The Outlander Chevron Shawl was knit in their Lhasa Wilderness yarn, a yak/bamboo blend. A perfect beginner shawl pattern, this garter stitch project wears perfectly as a wrap or bandana scarf. It’s constructed from the center outward and begins with a standard garter stitch tab, two techniques that you’ll come across again and again in shawl knitting. If you’re looking to try yak yarn and tackle your first shawl, I recommend this one (if I do say so myself)! Finally, we have a more challenging knit featuring Bijou’s yak/wool blend yarn. 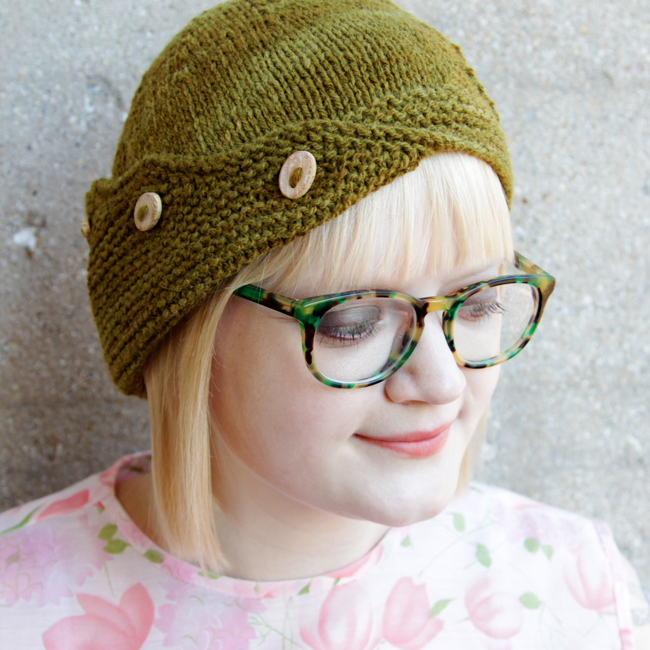 The Delta Hat is a cloche style hat featuring a button flap along one side and a fun triangle motif across the other. Since this is a wool blend, this hat is perfect for keeping warm in winter, but the yak content makes it really lightweight too. 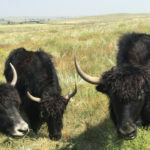 Yak yarn is kind of magic. 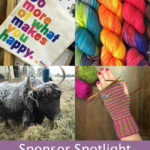 Enter to win Bijou Basin Ranch yarn! 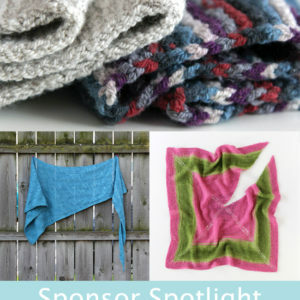 Enough about my patterns – let’s give you a chance to win some of Bijou’s great yarn! Last summer, they released a new yarn, Xanadu, that’s 100% cashmere. I’ve got a hank of this yarn in teal up for grabs – all you have to do to enter is select from the options below. Good luck! Bijou Basin Ranch is a sidebar sponsor of Hands Occupied. 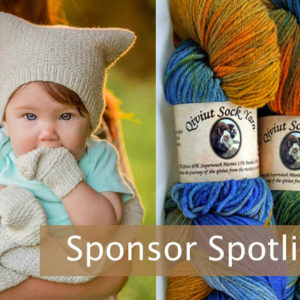 Previous Post: « Celebrate Heart Month with Knitting & Crochet! Ah, cashmere! What a treat! Thank you for your generosity. Wow! What a great giveaway! BB is the most wonderful yarns.